I’m heading into a nearby school district this afternoon and tomorrow afternoon to work with two groups of teachers on a technology workshop with the theme of “no cost technology for teachers.” I’ve been trying to figure out the best game plan (one day will be mostly middle school teachers and one day, mostly lower elementary). Here is what I decided. First of all, it’s not going to be me, talking. It’s going to them, playing. I just hope and cross my fingers that the tech people at this school have not gone overboard with their filter, although I have been assured that the filter will be turned off for my workshops. We’ll see. start with Wallwisher and get them brainstorming and sharing out ways they already use some technology in the classroom. These folks are from different subject areas. 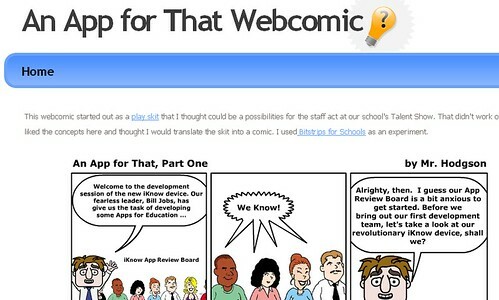 move to using Make Beliefs Comix for some webcomic creation, which is always a hit in workshops because the site is just so darn easy to use and requires no registration. This and Wallwisher are tools they could use tomorrow, if they wanted. shift to Glogster for the middle school teachers (this is where I worry about filter issues) and have them create a glog about a favorite book or author. I have set up accounts for them under my classroom. for the lower elementary teachers, instead of Glogster, I am going to have them use Storybird for picture book story creations. This seems like it would be more useful for them than Glogster. I have also created a list of “extension activities” that includes PicLits, Search Story Creator, and Voicethread. We’ll see how it goes. The workshop will end with another visit to Wallwisher for some virtual exit slips on what technology they can envision using with their students. Yesterday, I had this phrase bouncing around in my head — Shake out some ink — and I decided to try to use it as a frame to write a song about writing, about composing. There aren’t enough songs out there about the art of writing. I used a software called Super Duper Music Looper to generate the music, and then I used Audacity to record the voice. buried there in your mind. I finally pulled all four parts of my App for That comic together onto one website, so that all the pieces flow. I finally had some time to read through To Teach: the journey, in comics by William Ayers and illustrated by Ryan Alexander-Tanner and I have to say that Ayers message and Alexander-Tanner’s illustrations meshed so powerfully together that I decided I need to pass this book along to my student teacher (who left the other day as her time with me ended). In this graphic interpretation of Ayer’s reflections on being a kindergarten teacher (which were told prior in a book format), but also his philosophies of teaching in general (particularly the conflict between inquiry-based teaching and standardized curriculum) hit right home with me. I could have lived on Ayers’ words alone, but by bringing the medium of comics into the story, the entire thing just came to life perfectly. Ayers gives us stories of real teachers, and real students, making discoveries around learning and he doesn’t sugarcoat the hard work of teaching, either, noting that the teacher is often learning alongside their students, even in the younger grades. Tell me that is not a powerful statement! Again and again, Ayers relates how he, and how we, must try to resist the pigeon-holing of our students as special needs or labeling them with ADD when what we are seeing is the curiosity, the inquiry and the impact of home life on school life. The comic illustrations here are modeled on Scott McCloud’s work and the images are not just for fun. Alexander-Tanner effectively uses the medium to move from the concrete to the abstract, using visual representations of teaching and education, along with fine doses of humor, to help move Ayers’ writing along. The comic element is not just a throw-away device here — not just some selling point in this time of graphic novels — but a real addition to the storytelling. These 10 projects who came out on top of the Digital Media and Learning Competition (sponsored through HASTAC and the MacArthur Foundation) are interesting and really do seem to push the possibilities of learning in the digital environment. •	Conservation Connection: Using webcasting, video blogging and social networking sites, this project connects kids from Chicago’s West Side with kids in Fiji to work together to protect Fijian coral reefs. •	Mobile Action Lab: Combining the expertise of social entrepreneurs and technologists and the knowledge and ideas of Oakland, Calif.-based teens, this project helps develop mobile phone applications that serve Oakland communities. •	Click! The Online Spy School: Designed to encourage girls’ engagement in the sciences, Click!Online is a web-based, augmented reality game for teen girls to solve mysteries in biomedical science, environmental protection and expressive technology. •	Ecobugs: An augmented reality game that creates, collects and monitors the health of virtual bugs and their habitats. •	Fab@School: Introduces students to digital fabrication, mathematical modeling and engineering using a low-cost open-source system. Kids invent and design their own creations from mind’s eye to physical form. •	Metrovoice: Youth write and produce videos on an issue on their block or neighborhood. The videos are geocoded and play on city buses as the bus passes through the featured neighborhood. •	Nox No More: Enables kids to upload GPS-gathered data that trace their movements for a week—did they take the bus to their friend’s house or have mom drive? The data is converted to points, and kids compete to be most environmentally conscious. •	Hole-in-the-Wall: Installed in small kiosks on sidewalks, these computer stations offer games in a variety of subjects and skills to kids in Bhutan, Cambodia, India and elsewhere, bringing technology to underserved areas. •	Scratch: This simple programming tool allows kids up to age 8 to create their own games, stories, animations and simulations. The online network allows kids to collaborate on designs, offer suggestions to others, and learn from others as they develop as creative thinkers. •	Youth AppLab: This program supplements D.C. teens’ computer science classes with an after-school opportunity to create phone apps for the Droid. Winners of the best apps are offered internships with technology startups in the D.C. area. One of the units my student teacher took over was poetry and she had this great idea (from her own sixth grade experience) to have students create a pop-up book of their poems. It was pretty fascinating to watch (from my distance) the kids work on creating 3D books and they came out pretty neat. She used this site of pop-up creation techniques from Robert Sabuda. I grabbed some images from some of the books and made her a video for her portfolio. We just finished up an independent book unit and students had to choose some way to present their final thoughts about the book they chose. A few of them used Glogster, and I sort of wish more had. My room is filled with posters, which are wonderful but soon to be sent back home. This report by one of my students is well-done, and is about the 38 Clues series. Notice how she used a good design that combines the media with text and your eyes flow over the page. She “gets it,” I think. And so, I am bringing this writing adventure to an end with the last few frames of my “App for That” skit-turned-into-webcomic idea. One thing I struggled with was how to shift from one medium (play writing) into another (comic strip writing), and what to leave in and what to leave out. 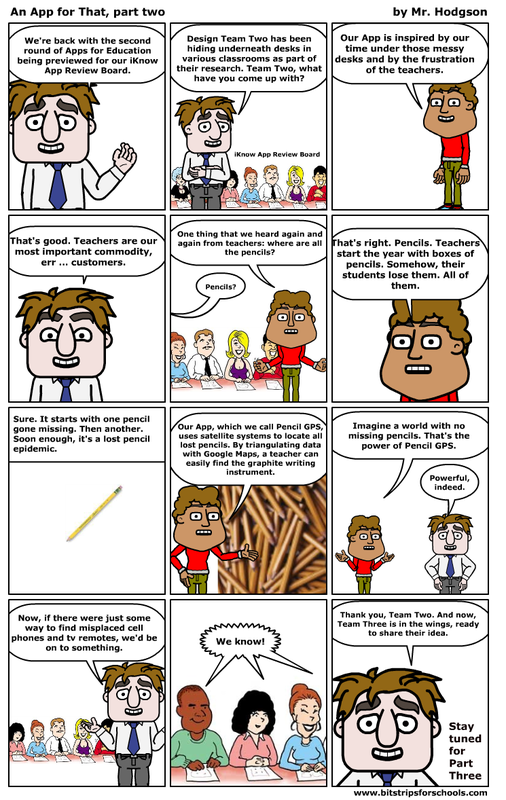 I’m not sure how successful I was but it was fun and it provided me with more experience with Bitstrips for Education, which is a site I will be using this summer for my Webcomic Summer Camp with middle school kids. I did like that I could easily make my own characters — it was quite simple, in fact — and upload other images, such as my walking iKnow device and the Greek Chorus (aka, App Development Review Board). And I had to get my old friend, Boolean, in there, too, since I did a whole series of comics once around his development of the Grade Remorse Calculator for an App Challenge that his school took part in. I hope you see how labeling him a “typical child” is funny. It is to me, anyway. See the full-screen version of the comic. 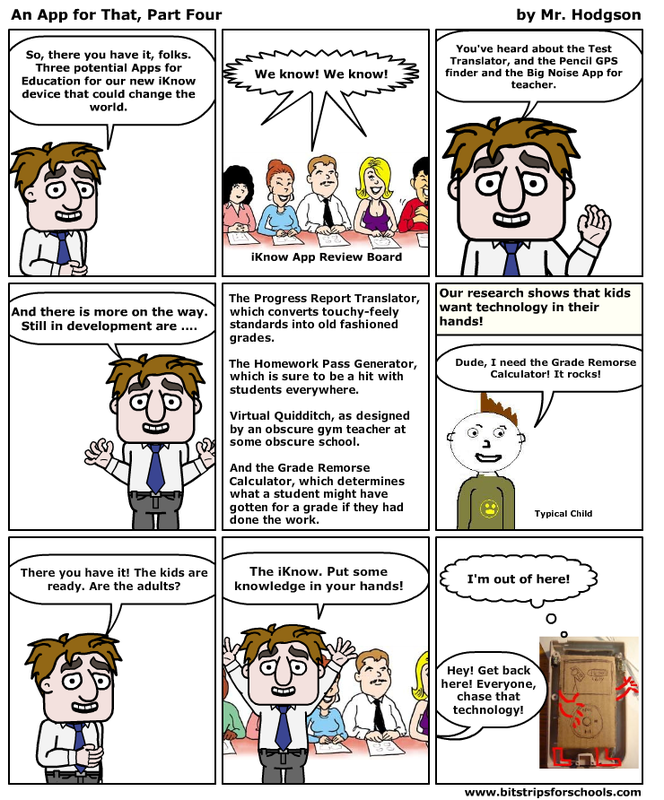 Here is the second installment of my App for That webcomic story, which I am constructing in Bitstrips. I was thinking about all those pencils that I seem to used to have had, but no longer can find. And why is that so many of my students don’t have their own pencils? It’s writing class, for goodness sake. 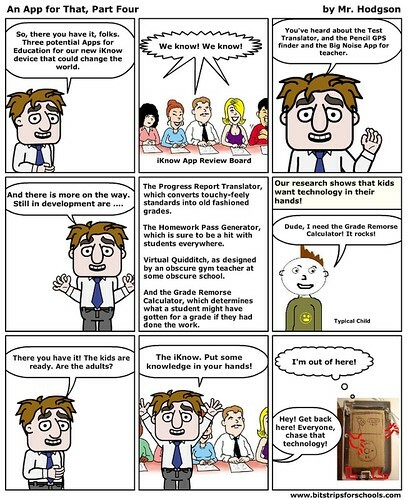 You can view the first part of An App for That webcomic here. A full screen version of today’s comic is here.